To Cubano on the "Ships starting with C" page. Lillesand Sjømannsforening also has a picture of this ship (and several other Norwegian ships - external links). Click in the photo to make it larger. Tonnage: 5810 gt, 3639 net, 8420 tdwt. Launched on Sept. 28-1920 by Joseph L. Thompson & Sons Ltd., Sunderland (Yard No. 533), completed March 9-1921. 3 cyl. triple exp. steam engines of 2900 ihp by Palmer's Shipbuilding & Iron Co. Ltd., Jarrow. Subsequently fitted with a low pressure exhaust steam turbine. Service speed 12 knots. A message on one of my forums related to the rescue of Cubano's survivors. The thread also has a message from the daughter of one of the survivors of Cubano, Rolf Simonsen. (archive doc gives arrival Freetown Aug. 21). The archive document indicates that Cubano was on her way from Norfolk to Horten, Norway when war broke out in the country on Apr. 9-1940, but must have been diverted. She arrived Boston on Apr. 23, remaining there for a month, before proceeding to Botwood, N.F. Cubano had recently arrived U.K. from Freetown with Convoy SL 45, cargo of maize and canned meat. This convoy had left Freetown on Aug. 26-1940 and arrived Liverpool on Sept. 15. See the external link provided in the table above for the names of other ships in this convoy. Cubano continued to Manchester, where she arrived on Sept. 16-1940, and about a month later, on Oct. 13, she departed Manchester in ballast for Montreal, Canada via Liverpool, with arrival the latter on Oct. 14. She joined up with Convoy OB 229 (station 94) east of Bar Lightship on Oct. 15, having gone out ahead of the convoy earlier that morning to correct her compasses. The Norwegian Polartank and Stigstad are also listed in OB 229. The 8(?) escorts left the convoy after dark on Oct. 18, and the following afternoon* the Commodore signalled for all the ships to steer towards 25° W (starting at 19:30 BST), at which position the ships were to continue to their individual destinations independently. The convoy was proceeding at 8.5 knots, but the Commodore later signalled for all the ships to start sailing at full speed, and Cubano soon went up to 11 knots. * "The Allied Convoy System", Arnold Hague gives the dispersal date as Oct. 18. She had not quite reached the dispersal position of 25° W when she at 23:25 on Oct. 19 (ship's time) was torpedoed by U-124 (Schultz) in 57 55N 24 57W (southwest of Iceland), struck amidships on the port side in No. 3 hold and stoke hold. The engine promptly stopped (steam pipes between the boilers and engines were broken), steam came gushing up from the engine room and the ship started to list to port and sink, but the crew waited till she had slowed down before lowering the 2 starboard boats (the port boats were destroyed), with the 1st mate in charge of the forward boat and the 2nd mate of the aft boat. The captain had remained on board, and once the steam had subsided somewhat he went down to the engine room to look for possible survivors, but when he saw how high the water had risen he considered it unlikely that anyone down there had survived, so he went back up, then investigated the situation in the aft of the ship with the help of Able Seaman Kristiansen. Finding no more survivors, and upon determining that there was little hope of saving the ship the 2 remaining men, after having gathered up some provisions and supplies, went in the 1st mate's boat which was waiting alongside. Due to the increasing winds and seas it was difficult to keep the boat along the side of the ship, and the captain fell in the water, but was quickly picked up by the boat. They rowed across to the 2nd mate's boat which had pulled further away, and the 2 boats remained about 1/2-1 mile in front of Cubano through the night. 4 ships passed them not long after they had gotten away from the ship; one of which responded to the SOS they signalled with their automatic lamp, but the ship continued on its away. They had hoped to get back on board at dawn to get some more clothes and food and to try to get in touch with other ships with the help of the emergency set, but due to increasing winds and high seas it was considered inadvisable to reboard, fearing the lifeboats might get damaged. Both boats stayed in the vicinity for a while, and while waiting there, they heard a cry. When they rowed in that direction a small raft with the sole survivor from the British ship Sulaco was found, 1st Cook James Thomson Harvey (this ship, also from Convoy OB 229, had been torpedoed shortly after Cubano had been hit, also by U-124 - ref. link at the end of this page). 1st Mate Patterson from the same ship had been clinging to the same raft for a while but was overcome by cold and exhaustion and had let go and drowned. A few hours later Cubano was so deep in the water that it became clear she would sink, so the boats set sail with a course for Scotland. They managed to stay together through the following, stormy night with the help of light signals, and the next morning, Oct. 21, they were rescued by the Canadian destroyer Saguenay (D 179) and landed at Greenock in the evening of Oct. 23. They were all sent on to Glasgow on Oct. 25. The maritime hearings were held there on Nov. 6-1940 with the captain, the 1st engineer, the 3rd mate, Stoker Andreassen, and Able Seaman Kristiansen (lookout) appearing. 2 had died, 30 survived (the survivor from Sulaco made them 31). Please see a message on one of my forums related to this rescue. The thread also has a message from the daughter of one of the survivors of Cubano, Rolf Simonsen. Jürgen Rohwer gives the time as 01:43 German time for Cubano and 02:29 for Sulaco, Oct. 20. For info, U-124 was also responsible for the attack on Siremalm the following year. 2nd Mate Hans H. Smith-Hansen later survived the sinking of Teneriffa, Thode Fagelund and Elin K - follow the links for details. 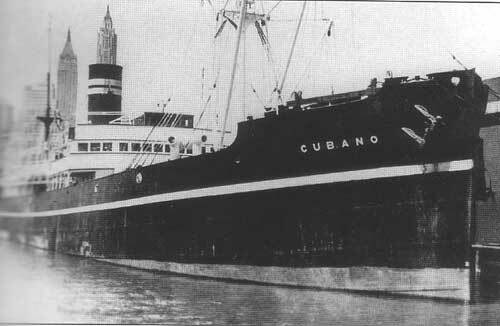 According to Lillesand Sjømannsforening, 1st Mate Kristensen (external page) had been on Cubano since the spring of 1938. He later joined Tijuca. Able Seaman Andersen joined Primero. * I believe this might be the Anton Minsaas who later served as 1st engineer on Madrono and died in a Japanese prison camp. Stavern Memorial commemorations - The 2 casualties are commemorated at this Memorial for Seamen in Stavern, Norway. Wilh. Wilhelmsen Today - with company history (see also the timeline). Back to Cubano on the "Ships starting with C" page. Wilh. Wilhelmsen also had another ship by the same name in WW I. She was sunk by gunfire from the German U-35 on June 3-1915, fifteen miles northeast of the Flannan Islands, Outer Hebrides, while on a voyage from Christiania (Oslo today) to the East Indies with general cargo. This ship had previously had Scottish owners and sailed under the name Strathmore, purchased by Wilh. Wilhelmsen in April 1915. She had been built in 1912. The text on this page was compiled with the help of: "Nortraships flåte", J. R. Hegland, Wilh. Wilhelmsen fleet list, "Sjøforklaringer fra 2. verdenskrig", Volume I (Norwegian Maritime Museum), and misc. others for cross checking info. - ref My sources.